Yes, November has already started and yes, Christmas and the best apps of the year roundup are just around the corner – but there’s still enough time to bring you some of the best new and updated Android apps from last month. From big names like Google, AOL and Instagram to lesser-known apps that can help you monitor air quality levels and record MP3s from YouTube videos. And if none of that is appealing, you can always go and play Minecraft: Story Mode, which also arrived in October. Not all the apps in this list are freshly-released this month, some are long-standing favorites that have been given a new lease of life with additional features. As a long-time user of Google Maps, it’s nice to see features like navigation detour and ‘cheapest gas’ routing options appear in Google’s primary mapping app. There are a few other tweaks still rolling out now, but the best part of this is undoubtedly no longer having to reset your journey if you need to make an unplanned stop. FullContact brought its smart contact manager to Android last month, which is a godsend if you’ve got contacts strewn across multiple accounts. Admittedly, the company did take its sweet time in bringing the app to Google’s mobile OS – it launched on iOS in January – but for fans of the service, it will have been worth the wait. As on iOS, it’ll notify you when people change their personal information and automatically update your records, so you don’t need to worry about it. It also draws together social info, like tweets and LinkedIn posts, which can help provide insight on why you’re not getting a response to your messages or calls, if the recipient is at a conference, for example. One thing TNW’s Editor-at-Large didn’t like about the service, however, is the way in which it fails to demarcate current and previous work histories. Like Vine? Love Instagram? Addicted to GIFs? If you answered ‘yes’, go and check out Boomerang’s one second looping videos immediately. Made with Instagram's new Boomerang app. 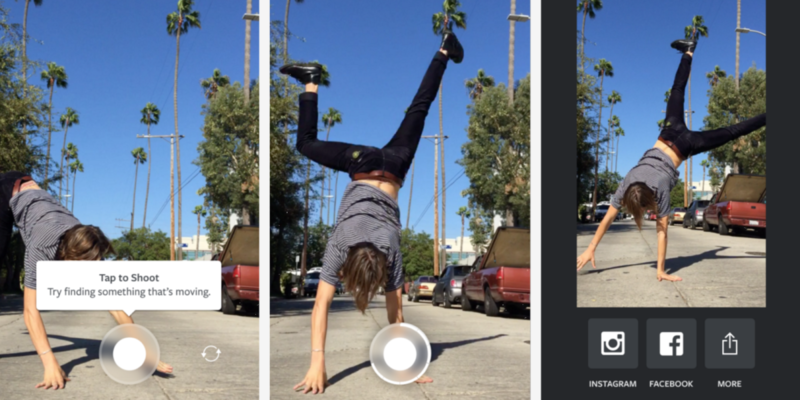 As you might expect from an app that lets you make one second videos, it’s not all that complicated. Just press one button to record and you’re done. The shared videos are actually four seconds long and create their GIF-like appearance by playing once, rewinding and then repeating. It’s available for iOS too. OK, it’s got a sort of stupid name and is similar to Instagram’s Boomerang app above, but Phhhoto’s arrival on Android in October was good news if you really like creating four frame looping images. You’re not allowed to use any of your pre-existing photos though – you can only create Phhhotos using images you shoot with the app. You are allowed to add filters, however. Once you’re happy with it, you can share them to the usual array of social networks. Peggo used to just be a handy online YouTube and SoundCloud recorder – and it still is, but now there’s an Android app too. It’s not yet as fully featured as its desktop counterpart but of you want an easy way of turning a YouTube video into an MP3, then Peggo’s free app is worth a look. One note: It’s not available via Google Play, so you’ll have to download it from one of the other app stores if you’re interested. Plume for iOS and Android is an air monitor that keeps you up to date on current pollen levels and a whole lot more. As well as telling you what the air quality is currently like, it also uses this historical data to predict future conditions too. It’s a bit niche, perhaps, but if you care about knowing about things like air quality, then Plume is free and worth a look. This one needs little introduction. It’s mobile. It’s Minecraft. But not as you know it. You play as Jesse in a choose-your-own-adventure-like spin on Minecraft that sees you venturing across Overworld. In the first episode, you’re tasked with saving the world from a monster. So, nothing too challenging then. Each episode does cost $4.99 to download though, so you’ll end up spending some cash if you want to play all the episodes. It’s also available on iOS devices for the same price. Yes, it does look pretty similar to Google Inbox but it makes it a whole lot easier to find those elusive attachments. Default ‘stacks’ include Photos, Files, Shopping and Travel. While it’s a nice – and free – email client for keeping things organized, it lacks some of the more advanced features of other options, like snoozing messages. Still, if your inbox is a mess, it might be worth a look. Google continued its push into gaming last month with new features for YouTube Gaming that eventually also made their way across to Google Play Games. While there are a couple of other small tweaks to each app, the most notable addition to both is the ability to capture gameplay without the need for special additional hardware. If you’re not a gamer, you probably don’t care either way but if you are this is good news indeed. YouTube Gaming is available for iOS too. Got an old Android device lying around at home? Want an easy way to turn any USB-based webcam, smartphone, laptop or tablet into a smart home security system? Check out Perch. While there are other apps that achieve a similar thing, Perch’s ability to allow you to monitor only specific parts of a room is particularly useful. Then, if it does notice anything unusual in those areas, you’ll be alerted on your Android device. More than that though, you can also choose to respond to the alert you see. So, now you have a way to shout at your dog when he’s chewing the couch while you’re out. A lot of apps promise to tidy up your home screen, make the launcher prettier or otherwise make you more efficient. Like those, Launchify provides a handy row of shortcuts for apps you access frequently. Unlike its rivals, however, Launchify also predicts the ones you might need based on your location and whether or not you’re driving to bring you ones you are most likely to need. You can also manually control custom shortcuts, thereby making it even more useful. It’s not going to change the world, but it might help make sense of your disorganized home screen. Medium got a big makeover last month across its Web and mobile apps, which focus on making writing a whole lot easier while on the move. Along with a new lick of paint, Marshmallow and Jelly Bean support the Android updates also bring a new sync feature that means changes made on desktop and mobile are automatically reflected on each platform. The update also rolled out to iOS devices, along with a couple more Apple-specific tweaks. If you need additional mobile numbers but don’t want to faff around with additional SIM cards, or perhaps you don’t live in the UK but need a UK phone number – for making calls to family based there, for example – then Swytch is worth a peek. As tends to be the case with this sort of service, your line rental is free (for the first six months, at least) and calls from your virtual number cost 6 pence per minute to a UK phone number (or per SMS). Calls between two Swytch users are always going to be free though. Once the six months is up, your personal number will cost you £4.99 per month, in addition to the calling costs. iOS users, fear not; there’s a build available for you too. If 13 new and updated Android apps aren’t enough to satisfy your needs, check out our roundup from last month, or our 60 of the best Android apps from 2014 post.